Radical feminism. Ecofeminism. Second wave feminism. Post-structural feminism. The term “feminist” has been preceded by countless qualifiers since its debut in France in the late 1800’s, but leading up to the November 2010 midterm elections, it has been paired increasingly with a word many believe to be its antithesis: conservative. 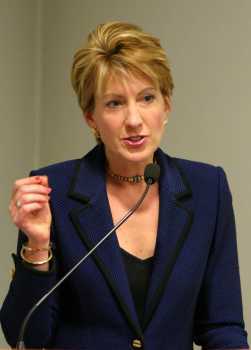 Carly Fiorina is a Senate candidate from Calif. Though their success so far is hardly outstanding, the 144 female Republican candidates in congressional primaries far outnumber the previous high of 104. Big names on the ballot include California Senate candidate Carly Fiorina, California gubernatorial candidate Meg Whitman, and South Carolina gubernatorial candidate Nikki Haley. Sixty percent of women House candidates who are challenging incumbents are Republican. This sudden conservative female presence in politics represents what 2008 vice-presidential candidate Sarah Palin has dubbed as a “pro-woman, pro-life” movement. “If Carly (Fiorina) wants to describe herself as a pro-woman candidate, I’d say presiding over a company where 28,000 people lost their jobs, many of whom were women; working to limit the ability of women to make their own reproductive decisions; and appealing to those who support the idea that climate change is not a significant threat does not seems like a pro-woman position to me,” said pro-choice PAC EMILY’s List director Jen Bluestein. Several political commentators and journalists have tried to define exactly what makes a “conservative feminist” earn that title. Others have questioned a “feminist” ideology that encourages women to mimic men—at least in the professional arena. Many of the Republican women on November’s ballot have a background in business instead of politics. Whitman and Fiorina were both CEO’s. While business and financial success are evidently integral to this movement, many of these women have said that family values and motherhood are also key principles. “When people say ‘pro-woman feminism,’ my suspicion is what they mean is ‘pro-traditional, feminine’ feminism,” said author Camille Hayes. Other critics claim that conservative dismissal of feminism that “victimizes” women and the emphasis on corporate success contradicts this worried-mother rhetoric. 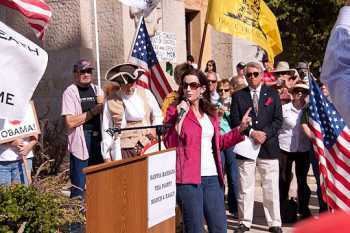 Is the Tea Party a feminist movement? So I thought the “mama grizzly” piece was definitely satire, until I saw it was on Palin’s website. I am so happy the internet will allow our grandchildren to look back at some of leaders and say WTF?